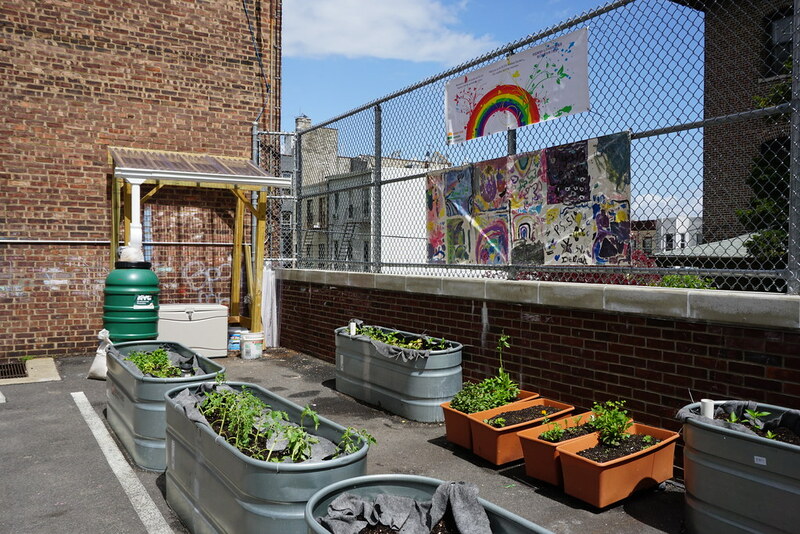 When parents at PS 516, a small elementary school in Sunset Park, Brooklyn, started looking for ways to create a school garden two years ago, the church next door granted them the use of a single parking spot in its lot. The Rainbow Garden that they built there must now be the most water-wise, sustainable patch of asphalt in the five boroughs. 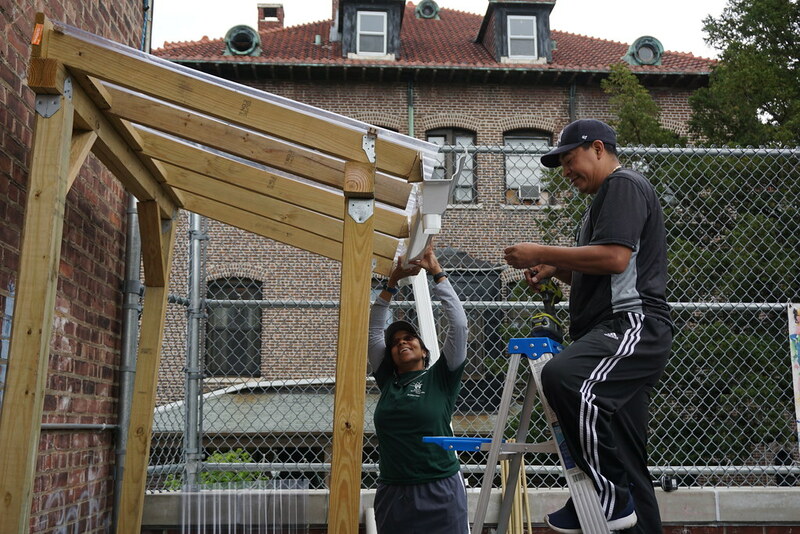 “The school community wanted an outdoor learning space for classes as well as a space for kids to explore growth and food,” says Courtney Epton, a PS 516 parent who helped spearhead the project. The garden consists of five large and four smaller sub-irrigation planters (SIPs) into which second-grade students have planted tomatoes, cilantro, peppers, greens, and other vegetables. A small awning shelters a storage bin for tools and supplies, and rain runoff from the roof collects in a 60-gallon rain barrel for watering the plants. 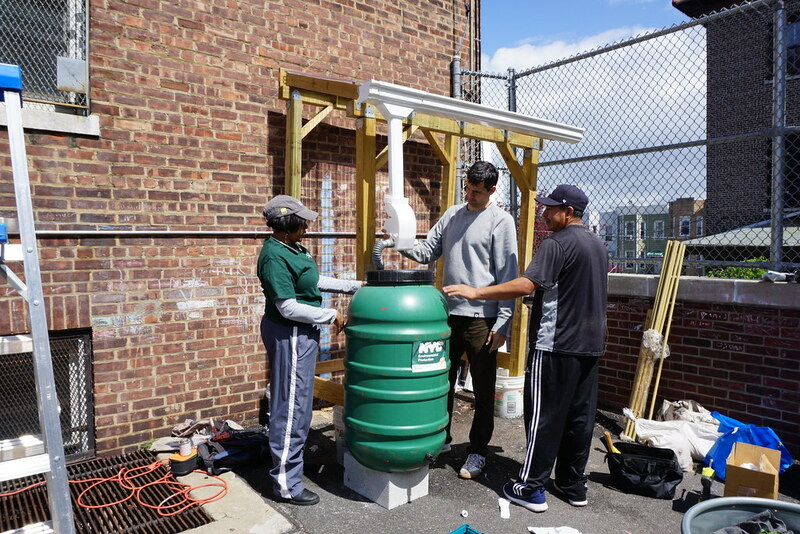 This rain harvesting system was designed by Giselle Pemberton, a member of the Brooklyn Urban Gardener team assigned to assist the school garden after Epton contacted Brooklyn Botanic Garden to request help. After Pemberton and four fellow BUG team members assessed the site last year, they came up with a new layout and signage to make the space more clearly designated and accessible to young students. Then the crew went to work on a plan that would allow the tiny garden to harvest rain in the barrel the school had acquired from the office of City Councilman Carlos Menchaca. The city Department of Environmental Protection is giving away the rain barrels to both reduce water consumption and help prevent excess rain from flooding the storm drains and polluting local waterways. Rain barrels are usually intended to collect rain from an external downspout leading from a home’s roof gutters, but many community and school gardens use them to catch runoff from sheds or the roofs of adjacent buildings. The BUG team had studied rainwater harvesting systems in their training, and Pemberton came up with a simple awning design after researching similar ones online. The five-person team built the 9-foot-tall structure out of lumber and corrugated plastic over the course of about six hours in the fall. 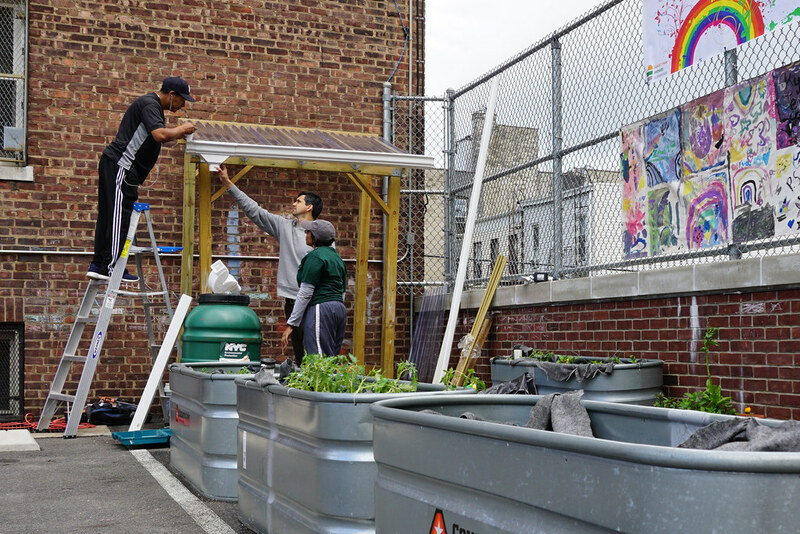 A grant from GrowNYC paid for the building supplies and planters. 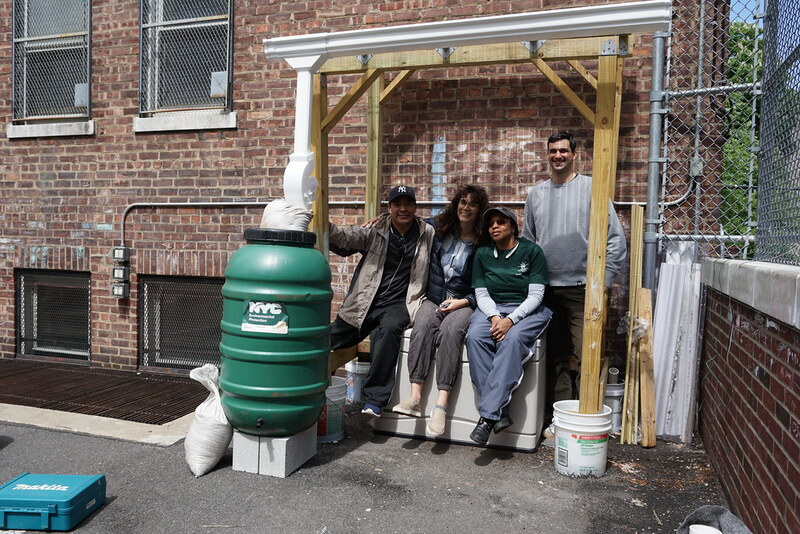 In the spring, Pemberton and several parent volunteers from PS 516 attached a vinyl gutter and downspout with brackets and hooked it up to the rain barrel. The 16-square-foot roof is expected to collect about seven gallons of water for each inch of rainfall. Brooklyn usually gets 3 to 5 inches of rain a month between May and October when the barrel is hooked up—enough to collect about 170 gallons per year. Two weeks after the project was completed in May, the barrel had collected enough rain to water the garden twice, says Epton, who is also the director of education for City Growers. “The staff and students are thrilled with the setup and new materials,” she says. First graders worked with City Growers to study garden irrigation in a series of workshops in the Rainbow Garden, and in the summer, kids in a City Growers day camp will care for and study the garden too. 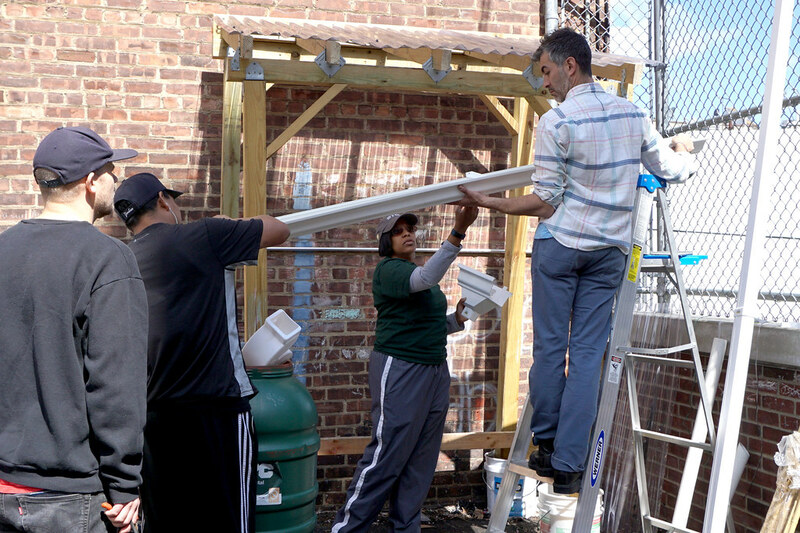 Brooklyn Urban Gardener Giselle Pemberton, center, and a team of parent volunteers installed the awning's gutter and downspout and connected the rain barrel in May. Photo by Lee Patrick. Placing the barrel on cement blocks allows enough space to fit a watering can under the spigot. Photo by Lee Patrick. The garden is not only providing an outdoor learning space but also helping reduce the burden of storm-water runoff on the city’s wastewater system. The awning roof is expected to collect about 170 gallons of rain each year in the rain barrel. The planters will also capture rain. Photo by Lee Patrick. Once hooked up, the rain barrel began filling up as soon as it rained later in the week. The shed is stocked with compost, watering cans, clipboards, crayons, and ponchos, so students can study irrigation come rain or shine. Photo by Lee Patrick.